German Made PAW Modular Hydronic Pump Stations are considered the leader in heating solutions with their patented modular distribution manifold. 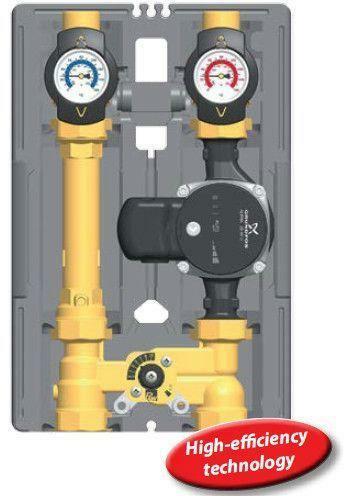 Now you can easily create multiple heating zones by simply dropping a pump station onto the manifold. No plumbing is required. Seamlessly integrates zones with different temperatures and flow rates into one complete system. PAW equipment is built around a centralized heating distribution system. 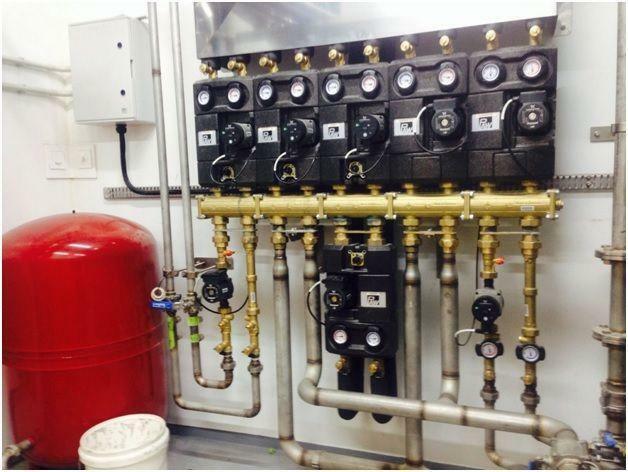 All zones can share the same heat source whether this is a boiler, solar heating or a heat pump. 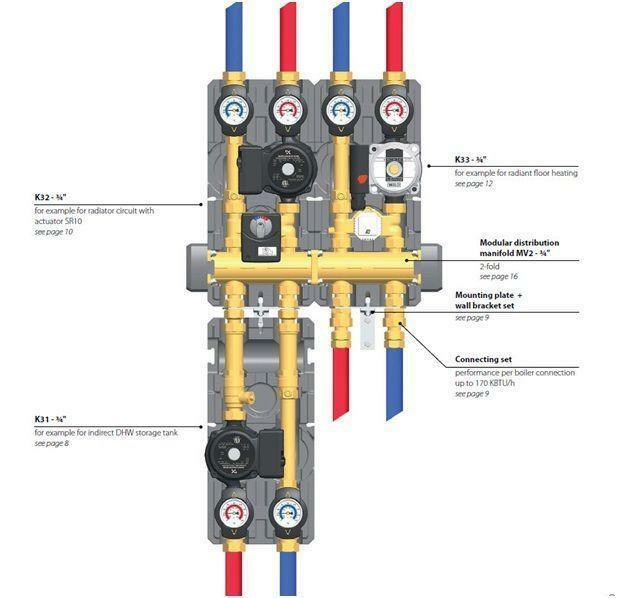 The plug and play hydronic design allows for customers to build one integrated solution to do hydronic heating loops, domestic hot water, fan coil radiators, pools/hot tubs and even snow melt zones. 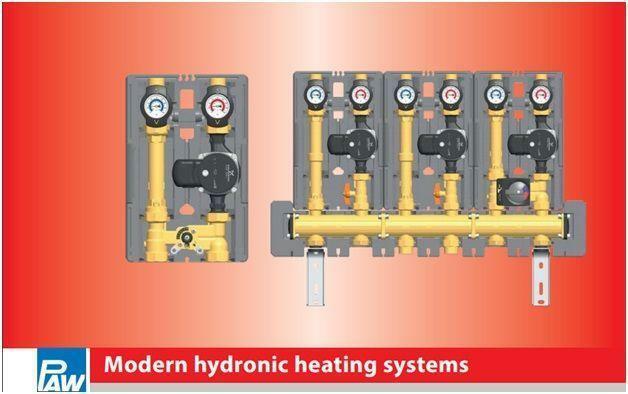 The system relies on Modular Distribution Manifolds that allows pump stations to be hooked up in parallel to share a common heating supply’s such as a boiler, solar thermal or a heat pump. These manifolds come in 2,3,4,5 loop configurations and can be expanded past that. 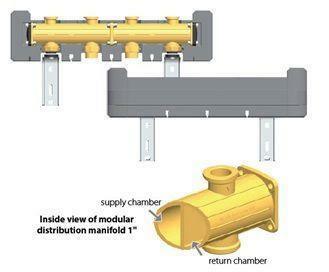 There manifolds share the supply and return manifolds from the heating sources on the bottom. The complete integrated pump station saves time on installation, allows for pump servicing and seamlessly integrates with the PAW Distribution Manifold for parallel installation of multiple heating circuits. 1” FPT allows you to attach to PEX or Copper pipe or use our Aurora Flex stainless steel piping for solder free connections. Accurate thermostats and brass ball valves add to the features of these pump stations. PAW pump stations come in a variety of sizes and can accommodate systems sizing up to 34 Kw. The Grundfos variable speed pump is available in different sizes to match the flow requirements for each zone. By adding multiple pump stations in parallel to the Modular Distribution Manual you can easily achieve a complete home heating solution for every zone requirement. K31 – High temperature Zone Heating with no mixing valve. 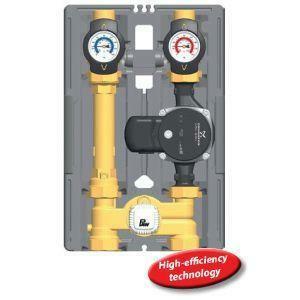 Ideal for all heating zones except hydronic. 1” NPT Connections. 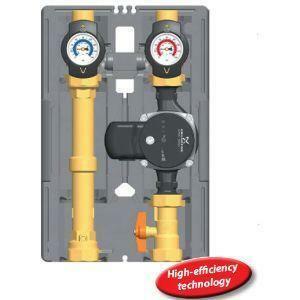 K32 – Hydronic heating Zone with electronic mixing valve. Ideal for any hydronic heating zone that requires mixing. Easily adapts to controllers with heating curve algorithms such as our Resol MX Controller to precisely maintain temperature control. 1” NPT Connections. 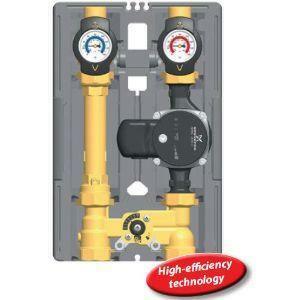 K33- Similar to the K32 except the K33 has a thermostatic adjustable mixing valve. Simply set the output temperature for the zones and not have to worry about changing input temperatures. 1” NPT Connections.